We’d love your help. Let us know what’s wrong with this preview of The Mature Mind by Gene D. Cohen. To ask other readers questions about The Mature Mind, please sign up. Is there a list of references for this book? This is a must read for everyone over 50. Here's what's coming and its not what you think. There is lots to be gained for growing older especially with the right attitude. And those myths. Debunk them now! I totally agree. I'm a vignette writer and story teller at 81. This is the much needed logical encouragement we all must have to happily live longer and get and give the most. An excerpt: page 55..."In the course of conducting studies with PET scans and magnetic resonance imaging, scientists noticed something unexpected going on in the brains of older adults. When, for example, young adults retrieve a specific word from memory, they usually use mostly the left side of their brain. Older adults doing the same task, however, often use both hemispheres. This phenomenon has been found with other tasks too, such as face recognition, working memory, and certain types of per An excerpt: page 55..."In the course of conducting studies with PET scans and magnetic resonance imaging, scientists noticed something unexpected going on in the brains of older adults. When, for example, young adults retrieve a specific word from memory, they usually use mostly the left side of their brain. Older adults doing the same task, however, often use both hemispheres. This phenomenon has been found with other tasks too, such as face recognition, working memory, and certain types of perception. The part of the brain examined in these studies is the prefrontal cortex in both hemispheres, a region that lies just behind the forehead. Much of this work has been described by Roberto Cabeza, of the Center for Cognitive Neuroscience at Duke University, He calls the phenomenon "hemispheric asymmetry reduction in older adults" --dubbed HAROLD for short." I have no idea if, despite using both sides of my old brain, this is pure science. I just like it, and 2 more facts: 1) the good Mr. Cabeza's last name, and the use of the acronym HAROLD, which is my cousin's coffee shop church's deity. We all know older people are wiser; now we know it's because they're using both sides of their brains! 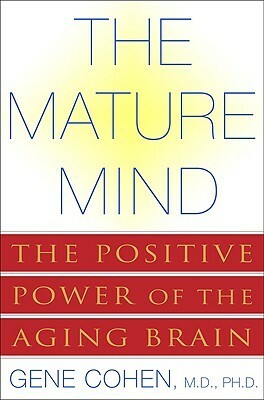 I liked the premise of this book: that the mind can continue to grow and develop in later life. Working memory, and the ability to easily learn new things, does deteriorate some, but the mature mind is better able to make connections, combine social and emotional intelligence with intellect, and use both halves of the brain. In brief, the wisdom that is supposed to come with age is a real thing. I have found that to be true in my 60 years, so the message of this book was affirming and certainly I liked the premise of this book: that the mind can continue to grow and develop in later life. Working memory, and the ability to easily learn new things, does deteriorate some, but the mature mind is better able to make connections, combine social and emotional intelligence with intellect, and use both halves of the brain. In brief, the wisdom that is supposed to come with age is a real thing. I have found that to be true in my 60 years, so the message of this book was affirming and certainly encouraging. But I think I would have been happier to just read an article that summarized the ideas in the book. It was a little repetitive, and went into more scientific detail about the brain than I really cared about. A gift from my wonderful son-in-law getting his doctorate in cognitive science. A must read for everyone over 50. Loved the intro quote since it captures all the difficulty traversing the myths of aging. Here's to a much more hopeful, wondrous reality! THANK YOU, JOSH! Picked this book up fairly cheap. I actually heard the author speak once which was a positive experience. I liked his presentation which covered some of the information I believe is in this book. Lent the book to a neighbor who really liked it. Some of the cases were infuriating but this book explains why I feel better at problem solving, am more empathic and understand complicated entities better than before. It gives hope to us middle aged people and gives us a reason to keep pushing our intellectual limits. Good news for us with aging minds! Cohen dispels many myths and provides support and opportunity for mental development in later life. There is reason to be optimistic about our aging brain. Contrary to commonly held belief the brain does not inevitably decline.